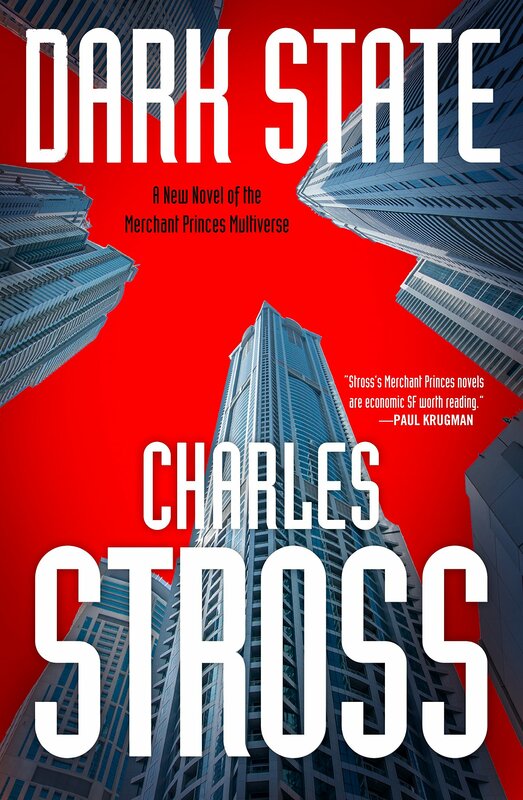 Before reading Empire Games last year I had never read a book in the Merchant Princess series by Charles Stross. Empire Games is the first in a new trilogy that would not require prior knowledge. I certainly did not regret reading it. I have been looking forward to the second novel – Dark State – ever since. The Merchant Princess is set in a alternative universe in which certain people can travel to parallel worlds. It is called jaunting or world-walking. Such people are members of The Clan and the novels set before Empire Games dealt with their internal civil war. A war that eventually destroyed their home-parallel-world of Gruinmarkt at the hands of the modern day United States of America. Empire Games and Dark State deal with the aftermath of these events. Survivors of the Clan have taken shelter in a world in which the British and French Empires rule the world. Both Empires are just coming out of the electricity revolution. Clan survivors under the leadership of Miriam Beckstein hope to industrialize this world with their powers of travelling between worlds to obtain protection against the US. The US meanwhile is quickly becoming a totalitarian police state. Dark State continues the story of Rita Douglas, a reluctant jaunter in service of the US. In Empire Games Rita jaunted to the New American Commonwealth, the successor state to the British Empire after the monarchy was overthrown in 2003. Miriam Beckstein and her clan members have made a deal with the Commonwealth to enable rapid industrialization. The Commonwealth is thus aware of jaunters and Rita is quickly captured. There she learns Miriam is her mother, who sends her back to the US of A with a message to negotiate a truce. In Dark State Rita is sent back and forth and quickly discovers she is no more than a pawn. She might have a special ability but the US government has figured out how to activate jaunting through gene splicing. As such Rita’s days are numbered. As she is the natural born daughter of Miriam Beckstein it is only a matter of time until she is considered a liability. Two people she can confide in are her grandfather Kurt and her girlfriend Angie. Kurt is part of a former Stasi sleeper cell and has indoctrinated his step-granddaughter in the spy tradecraft. Angie, a former childhood friend of Rita is part of the same cell. Both Kurt and Angie understand they need to extradite Rita from her service with the US government before they get rid of her. Rita’s boss Colonel Smith is partly aware of her connection to the Stasi but without having any proof he continues to use her. With Kurt and Angie it is refreshing to see how members of a former totalitarian regime now use their skills to undermine an emerging one. However, despite the cat and mouse game throughout the book Kurt does not have much to do. Although his character is set up for a larger role in the third book. Meanwhile Rita’s world is slowly turning sour. In Empire Games she was reluctant to work for the US government, but she was cajoled into it and by the sense of adventure of jaunting. However, in Dark State Rita learns of her background. She learns why her mother Miriam gave her up for adoption. She finds herself slowly to start working for the Commonwealth while she should be spying on them for the US government. The feeling of divided loyalties seems to be an overarching theme with nearly all of the characters. Dark State also introduces a new character, Elizabeth of Hannover, daughter of Emperor-In-Exile John Frederick the Fourth. She lives with her father’s household in the French Empire as her father attempts to restore his throne. Just like Rita she is stuck, just 18 she is expected to marry the heir to the French Empire for future support. The heir is a serial philanderer who suffers from multiple STDs. Elizabeth has other plans and secretly agrees to a deal with Miriam to defect to the Commonwealth. Thus begins a cat and mouse game in which clan member Hulius Hjorth is tasked to retrieve Elizabeth by jaunting into parallel worlds. This storyline ends on a cliffhanger when the US government interferes. Hulius is captured but the importance of Elizabeth is overlooked. Elizabeth finds herself stuck in modern day Berlin but is more determined than ever before to escape her fate when she becomes aware of the technological marvels of the modern world. Miriam attempts to contact Rita’s adaptive grandfather Kurt to help her find Elizabeth. Thus Dark State ends on a cliffhanger, and a good one to. There is no way in hell I will not be reading the third book Invisible Sun. I suppose that is the ultimate compliment you can give a sci-fi thriller. With the premise of jaunting or world-walking author Charles Stross does a fabulous job of finding the limits of his fictional world. I enjoy how none of the characters in this story are stupid. They are self-aware and always on the lookout to outwit each other. That gives the story a dynamic despite the separation of worlds. Dark State is available now for $ 17.10 on Amazon as a hardcover.